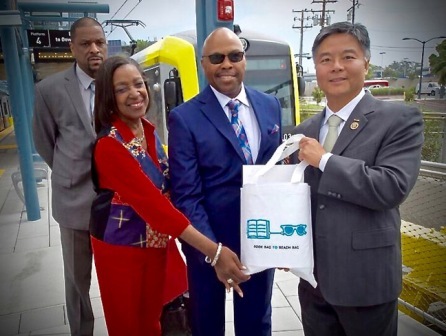 Congressman Ted Lieu (CD-33) joined officials from the Los Angeles County Metropolitan Transportation Authority (Metro) and Skanska USA Civil on Aug. 11, to tour the recently completed Exposition Light Rail Transit Phase 2 (Expo 2) project, which extended service from Culver City to Santa Monica. The project tour began at the La Cienega/Jefferson Metro station where Phillip A. Washington, Metro CEO, Jacque DuPont Walker (Mayor Garcetti appointee to the Los Angeles County Metropolitan Transportation Authority), Inglewood Mayor James T. Butts and Brian Freund, vice president of Operations at Skanska USA Civil, gave presentations. While locally, Angelinos voted to pass sales taxes last year to cover some of the infrastructure cost. Metro CEO Phillip A. Washington provided and overview of how successful infrastructure must work. The group discussed the need to increase budget allocations for domestic discretionary investments and, more specifically, transportation infrastructure investments. They also emphasized the importance of the Capital Investment Grants Program and the Transportation Investment Generating Economic Recovery (TIGER) Grant Program that support rail infrastructure investment as well as transportation, housing, and urban development goals. Phase 2 of the Metro Expo Line project is 6.6 miles long and connects Santa Monica by rail to downtown Los Angeles and the rest of the 105-mile Metro Rail system that extends to the San Fernando Valley, the San Gabriel Valley, the South Bay, Long Beach and many points in between. Major construction began in 2012 and was completed in 2016. Also in attendance were: Rick Meade, Executive Officer of Program Management, Metro; Frank Alejandro, Senior Executive Officer, Metro; Jonathan Hofert, Senior Engineer, Metro; Marisa V. Yeager, Senior Manager of Federal Affairs, Metro; and Will Resch, VP of Grassroots Advocacy, NRC. Ad­ditional information provided by Metro. Be sure to visit the Los Angeles Sentinel Facebook page to see an exclusive interview with Con­gressman Ted Lieu where he discusses Metro, Trump, Infrastructure, North Korea.